You are not having a deja vu. This is a new promotion! Coupon code SCREAM3 gets you 20% off Local Deals and 5% off Groupon Goods offers at Groupon. The coupon code expires on 10/27/15 at the end of day. The coupon is limited to one unit per transaction. During this promotional period, you can use the coupon on up to three Local Deals and up to three Goods offers. The maximum discount is $50 per transaction. Some exclusions apply (I haven’t memorized them …yet). Camera and photo gear are under the Electronics section of Groupon Goods, so they are eligible for 5% off with the SCREAM3 coupon. While finding Goods (camera gear) offers is fairly simple, finding the various photo-print offers under Local Deals is a bit more tricky. 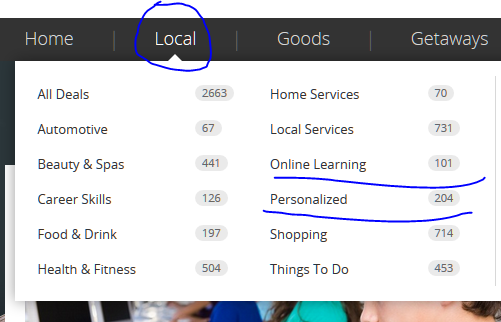 If you are not familiar, start at the Groupon Home page, then click on the “Local” option in the menu bar up top. The local links vary depending on each person’s city, so I can’t create general-use local links. Many of the photo print offers are located under the “Personalized” sub-category of Local. Some are under “Shopping”. Photography-related classes are under “Online Learning”. If you have a Prime membership, you are also eligible to shop using Amazon’s PrimeNow feature (free 2-hour local delivery). In recent days, this service became available to more highly-populated areas (Houston, San Antonio, Los Angeles, Twin Cities, Northern California Tech Bubble Bay Area). If you haven’t used it before, coupon code GETITNOW gets you $20 off an order of $50+. You have to use the Prime Now app (available on iOS, Google Play, Amazon’s appstore) to make your purchases. You can’t use the regular Amazon website for PrimeNow orders. Sicne it is local delivery within 2 hours, you can only purchase items available at your local Amazon warehouse. Only items sold and shipped by Amazon actual are eligible. I haven’t used this service yet, but I will try to do so over the weekend, so I will have a mini-report for you early next week. B&H Photo has launched their PhotoPlus 2015 Specials. Some of the offers require promo code PPEBH15 to activate. More on these tomorrow as I go through them, but in the meantime, you can peruse them at your leisure. eBay has launched another one of its semi-curated sales, this one is a featured Camera Gear Sale featuring 448 items. Due to time constraints I cannot go through them all right now, so it is YMMV. eBay rotates these type of offers, so they typically only cover a percentage of the participants in the eBay Rewards program (aka eBay Bucks). This new promotion, which started at 11am ET today and ends at 3am ET on Wednesday 10/14/15, requires, as usual, manual opt-in – you click the “Activate Now” in the offer email or message. This offer gets you 4X eBay Bucks (= 8% of the purchase price) on individual items priced at $100 or more. You can use it as many times as you like during this promotion but the maximum rewards are $100 Rewards per single item, and $500 maximum Rewards total per customer. eBay Rewards become available to you only if you have a balance of $5 or more, so if you are an occasional shopper or only buy low priced items, you may never see a penny out of them. Which is perhaps why they do these 4X promotions on more expensive items, since a single $100 item will get you $8 in rewards. PLEASE NOTE: add items of interest to the shopping cart and check the discounted prices (when logged in with Amazon Student account). I do not have an Amazon Student membership, so I cannot test these. For the speed-readers, you must be signed up as an Amazon Student for these offers. It does not work for regular Amazon shoppers or regular Amazon Prime shoppers. Only Amazon Students! (“Amazon Students” is a membership program, you have to join in, it does not mean an Amazon shopper who happens to be a student somewhere). If you qualify, you can Join Amazon Student with a free six month trial. Since I am posting almost daily Lightning Deals round-ups, on days I don’t post them, it raises the question: is the blog running behind or are there no deals? To help answer that question, I am trying a new experiment, this re-surfacing post that answers that question. (to prevent filling up the blog with no-op posts, I simply change the date of the same post and move it up/down as needed). As of around 1:40am ET on Thursday there are no camera and photo related lightning deals scheduled in the Amazon Gold Box that are of Camera & Photo interest for Thursday 10/8/15 (except for selfie-sticks of course). CAVEAT: please note however that “Deals of The Day” get revealed at 3am Eastern every night, and those are typically not “teased” ahead of time. Also keep in mind that some of the lightning deals just go live at the Amazon website without them appearing in the “teasers”. These obviously I can’t catch ahead of time. This is a YMMV targeted promotion. I have no way of knowing what percentage of eBay users are getting this, thus the YMMV Targeted. Check your email or eBay Inbox to see if you qualify. You must manually opt-in to this offer by clicking a button. If you list and sell items on eBay by certain dates, eBay will send you an eBay coupon of up to $100 to use on future purchases. If you are a fan of “The Rakuten” (an ancient race of anime creatures trying to take over the Amazon river), they have a new promotion good until the end of October 2015. Coupon code REWARDME gets you 5% back in Rakuten Rewards points sitewide when you shop at the Rakuten website (formerly Buy.com). Please note this is a YMMV promotion. Amazon has been running multiple of these promotions the last few weeks, but each time, only a percentage of their customers are eligible. As fate would have it, I am finally eligible for one of these, so I can tell you what happens. You find out if you are eligible if you are logged on to your Amazon account and visit the Auto Reload Rewards page. If you are eligible, you will see the promotion mentioned below. Buydig is offering an extra 15% off their Clearance Sale items (670+ items) when you use coupon code CLOSEOUT15 over there. The camera and photo gear is divided in multiple sub-categories (use the left side “Guided Search” over there to look for items of potential interest). Cowboom (formerly DealTree, part of the Best Buy Empire) has a 20% OFF coupon promotion with coupon code BOOM20 good until the end of day on 10/1/15. The coupon can be used on almost everything but it excludes the Deal of the Day, Auctions, and items sold/shipped by Best Buy. A lot of their items are used/refurbished. A DIY adventure! If you are a fan of “The Rakuten” (sounds like a creature! ), coupon code REWARDME gets you 5% back in Rakuten Rewards points site-wide (including tech/camera purchases) at the Rakuten (formerly Buy.com) website. Offer ends at the end of day on 9/30/15. On the shipping front, there are good news for Monoprice fans in the East and Mid-West regions. They have opened a distribution center in Kentucky carrying 1400+ of their most popular products. Speculation: one frustrating thing with shopping at Monoprice is that there is consistent way to predict whether you will pay shipping or not. Most other retailers have predictability (purchases over a certain amount or membership or free shipping for almost everything). Maybe the launch of an Eastern/Midwest distribution center can make it easier to give customers a non-moving target. Again, this is pure speculation. If you are a fan of the Rakuten, coupon code REWARDME gets you 5% back in Rakuten Reward points when you shop at Rakuten (Buy.com) website. Offer ends 9/30/15. To celebrate its Emmy wins, on Friday 9/25/15 Amazon is having a 24-hour special promotion for new Prime member signups, you can signup for a One Year Prime membership for $67 instead of its usual price of $100. The offer will be good on Friday 9/25/15 in the pacific time zone. The offer is good for new members only, not renewals. The offer will be live Friday 3am ET until Saturday 3am ET. If you have an American Express credit card, you may be eligible for an AMEX Offer that gets you a $20 statement credit if you spend $20 or more at the Sam’s Club website (not their stores) and pay for it with the AMEX credit card that is offering this promotion. This is YMMV because they don’t offer every offer to every card member. You have to opt-in first by clicking the “Add to Card” button while logged on to your AMEX account. If you have multiple AMEX accounts, make sure you activate the offer with the credit card you are going to use to pay for your purchase. A couple of minutes after you make an eligible purchase (they are that fast! ), you get an email from AMEX telling you that pending validation, you have used the offer. Sam’s Club is a membership club. If you are not a member, depending on your local state laws, you can either make a purchase with a 10% surcharge or get a free 1-day trial by creating an account there. Strategery: This is their camera and photo page, but be sure to price-check any items you may not be familiar with. And factor in the $20 AMEX statement credit. Of particular interest are items that have the same prices at all authorized dealers. The statement credit is a virtual $20 off discount. Prime members in the Los Angeles and Orange County areas have a new Prime benefit going live, the Prime Now service. To celebrate the launch, Amazon offers coupon code LATRYNOW to get $20 off an order of $50+. This can be particularly good if you are buying items that have the same prices at all authorized dealers. The coupon is good for physical items sold and shipped by Amazon itself. I am not in a Prime Now area yet, so I can’t test it and tell you more about it. Details and terms and conditions at the Amazon Prime Now page. PS: that page also mentions coupon code TRYITNOW that’s also $20 off a $50+ order. I don’t know if you can use them both, on separate orders, or stack them. I can’t test this, so this is DIY YMMV. PS2: Prime Now is purchasing regular Amazon items. It should not be confused with AmazonFresh (fresh foods and groceries) or Prime Pantry (someone’s twisted idea of a virtual Costco). This is YMMV because I don’t know if eBay sends these type of offers to every person participating in their eBay Bucks rewards program or some of them. So if you received an email from eBay or saw this offer in your eBay Messages, then it means you are eligible. This is important because you have to opt-in for the offer, that’s how it activates. So with this offer, you earn 5X eBay Bucks (which is 10% since 1X = 2%) on purchases of individual items that are priced $50 or more. You can use this offer on as many items as you like. The limits are $100 rewards on a single item, and $500 total per account during the promotion. Offer expires on Thursday 7/17/15 at 11:59pm pacific time. A good place to start looking for ideas are the eBay Deals du jour. If you are a student, you may be eligible to get a FREE one-year NewEgg Premier subscription (free shipping, typically costs $30/year). This is different from the Adobe academic discounts. Your eligibility depends on whether your school is a partner with NewEgg Business (their business B2B site). So you get a free Premier subscription at the regular NewEgg website, but your eligibility stems from your school’s partnership with NewEgg business. More details at the promotional page. You can confirm there your school’s eligibility by entering your school’s email address. BorrowLenses.com is offering 25% off rentals with coupon code FLASH25 in a new promotion. The coupon must be used by the end of day on 9/9/15. The rental period must start by Saturday 9/26/15. The coupon is good for rentals only. Rakuten (ne’e Buy.com) has another rewards promotion. Use coupon code REWARDME to earn 7% back in Rakuten Rewards on technology purchases, and 10% back on non-tech purchases at the Rakuten website. Promotion ends at the end of day on 9/7/2015. This is not a discount on the purchase price, but rewards to be used in future purchases. The earned rewards are of a promotional nature, you have to use them within a specific time period, which makes them better suited for regular Rakuten shoppers (or very organized shoppers who can plan and organize purchases ahead of time in a Spock-like fashion). Borrow Lenses has a new coupon offer, this time it is a fixed amount discount, $20 off a rental order with coupon code GEARSAVE20 entered during the rentaling (proposed new word candidate!) process. You must needs place an order by 9/7/15, and choose a 9/11/15 or earlier as the delivery date. Details, terms and conditions at the coupon page. This is a YMMV promotion. Check your email (associated with your eBay account) or your eBay Messages to see if you qualify. From now until October 15 (2015), you can list to sell up to 80 items, either fixed price or auction style listings. If you find auction-style listings too cumbersome, this offer is good news because fixed price listings are also included. Free are the Insertion Fees. You still have to pay the Final Value Fees (for items that sell) and any other upgrade or optional add-ons to your listings. Check the email/message for the full terms/conditions. REI is having their labor day sale on their website, plus they have coupon code OUT20 that gets you 20% off on a single item from their Outlet store. Outlet items have prices that end in $x.73. Details and restrictions at their coupons page. The coupon ends 9/7/15. If you live near one of the 127 national parks (out of 408 total) that charge admission/entrance, on specific days every year (MLK, Prez weekend, Park Week, National Park Service Birthday, Public Lands Day, Veterans Day), you can get FREE admission. Details, restrictions, list of parks, and days/dates that offer free admission for all can be found at the National Park Service website. BorrowLenses has a rental double special for Labor Day. Coupon code GETGEAR20 gets you 20% off and if your rentals are scheduled to overlap with Labor Day, you will also get an extra day for free. The coupon is simple, the latter is a bit more complicated. It is explained in detail at the Borrow Lenses website. The coupon is for rentals of camera gear, not purchases. Good until Monday 8/24/15 night Sunday 8/23/15 night, coupon code HOT15 gets you 15% off sitewide at the Monoprice website. The usual restrictions apply (Tamron lenses not eligible). More details over there. Monoprice has a variety of bang for the buck camera and tech accessories in general. Good until 8/31/15, if you have enough Citibank Thank You Rewards points, they are having a 20% off redemption sale on select items available through their rewards program. The offer slideshow shows the Nikon Coolpix S7000 and S33 waterproof, the GoPro Hero + Handler, etc. I don’t know if the list of rewards differs depending on which credit cards you have linked to your Thank You account so there might be a bit of YMMV. No coupon needed, the points needed to redeem are adjusted automatically by them. Strategically this may be a good deal if the discounted redemption price in points is lower than the actual price at major retailers, and if it is better compared to other redemptions (eg gift cards for various retailers). This is a targeted offer, so YMMV. Check your email or eBay messages. One offer that is circulating now that runs between August 20-26 in 2015 gets you 1000 free auction-style items (including relists) with free subtitles. Check the terms and conditions of the offer. Might be of interest if you sell prints or want to have a virtual garage sale of gear you no longer need. Amazon seems to be having a midlife crisis Big Bang of sorts because they are expanding in all kinds of different ways. If you live in an area that is eligible for Prime Now delivery (one hour delivery of your purchases; for Prime members only) and you haven’t placed a Prime Now order before, you can get $20 off your first order of $50 or more with coupon code TRYITNOW entered over there. An expiration date is not mentioned. If you have an American Express credit card, check your Offers section (below the account summary when you logon to your account – on the desktop browser page). Their computers decide who(m) to offer this, so there is a YMMV here. One of the recently added offers is this: pay $75+ and get $15 back as a statement credit to your AMEX account at ExposuresOnline.com (they sell photo albums, picture frames, etc). You have to manually opt-in to the offer (by clicking the “Add to Card” button) before you use it. Once you opt-in, the discount happens automatically on the back-end. They will send you an email once a qualifying transaction arrives at their system. This offer ends 10/14/15 and can be used once during this promotional period. This applies to everyone: when you visit the Exposures Online site for the first time, a window pops that offers you a 15% off coupon discount if you are willing to enter your email to join their email list. Good until the end of day on Thursday 8/20/15, coupon code HOT gets you 10% off Monoprice.com on Monoprice branded items. The 3D printer and a few other items are excluded. The Tamron lenses are not eligible since they are not Monoprice-branded (yes, Monoprice sells Tamron lenses!). Monoprice has a variety of aggressively priced camera and photo products. Search for the items of interest, or peruse their Camera and Video pages. Another coupon promotion from BorrowLenses.com. Use coupon code GETGEAR20 to get 20% off a rental order. You must place the order by 8/31/15 and the order must be received by 9/4/15. The coupon covers rentals of cameras, lenses, lighting equipment, bundles or anything else they offer for rent. Aquatech products are excluded. This promotion can only be combined with a BL membership discount (a membership is $99 per year, with an automatic 10% off discount on rentals, free t-shirt and a couple of other benefits). A lot of recent camera models are rarely discounted, so one way to get some kind of a discount is through rewards. Case in point, Rakuten (Buy.com) is offering 7% back in Rakuten rewards on technology (and 15% back on everything else) when you use coupon code REWARDME when you make a purchase at Rakuten.com. Offer ends by the end of day on 8/20/15. This is not a discount, but reward points added to your Rakuten account. Reward points are promotional points, they have to be spend within a specified amount of time, which makes this perhaps a better offer for frequent shoppers there. BorrowLenses.com offers a 15% off discount by using coupon code BTS15 on any rental order that starts by Friday 8/21/15. The coupon expires 8/17/15.